Tomorrow morning is the announcement of the Caldecott, Newbery, and other Youth Media Awards. 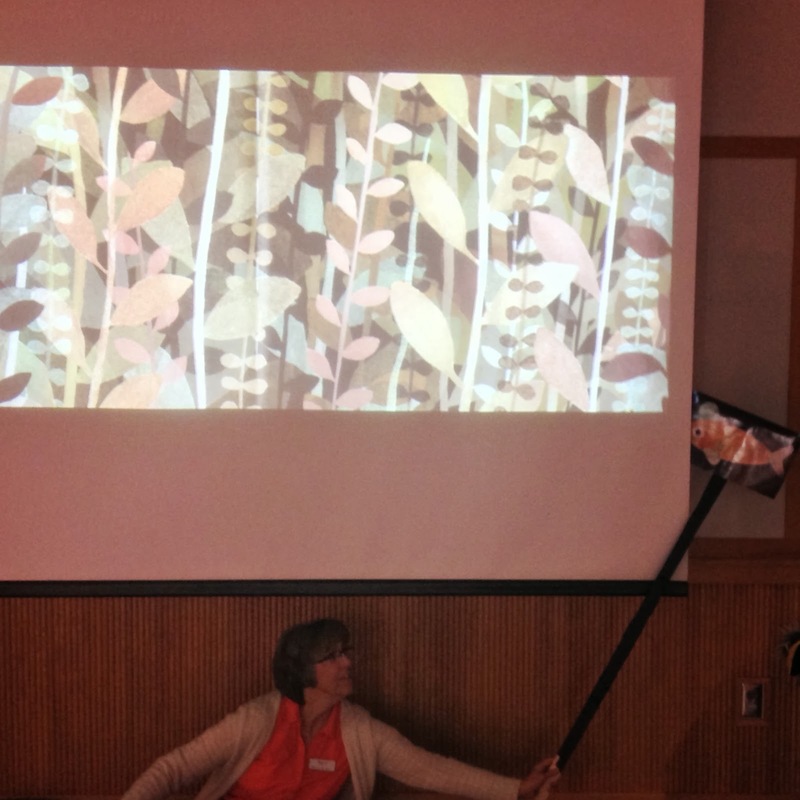 I don't have a role in that like I did last year (Newbery Chair), but I got to relive the moment in a different way: I used one of the award winning books in Storytime. No, we didn't do a puppet show of The One and Only Ivan...but I've been wanting to do This Is Not My Hat for a while, and since Terri and I had a "Getting Dressed" theme last week, we had the chance. Using the illustrations was a must, of course, so we scanned a selection of these to project on the screen. But I also wanted to get Little Fish into a more active role. First I thought I would use a hand puppet fish and move him around in front of the screen, but no, it has to be the Little Fish from the book. So we scanned, enlarged, printed, laminated, and stuck it onto a long stick. 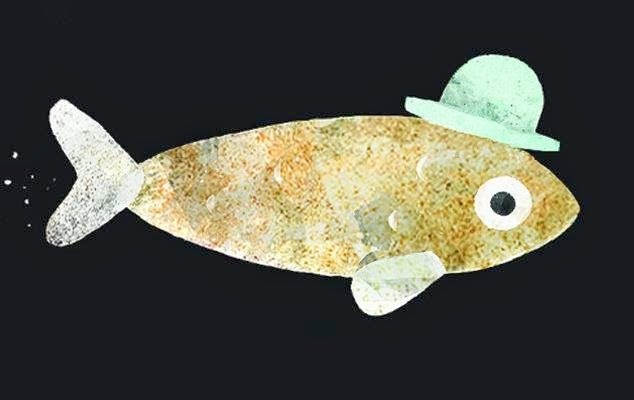 I started out with a script that followed the book exactly, but Terri had a perceptive suggestion: In the book Little Fish says "it" a lot when referring to the hat and "him" when talking about Big Fish. This works great on the page, but we knew the sparseness of the text would be a challenge for the younger side of our audience. So we inserted "the hat" and "the Big Fish" several times, just to make it all clear for the 3's and 4's. For the images, I scanned most, but not all of the images, cropping Little Fish out (since he would be the stick puppet). So we had a nice background for Little Fish to move around in front of. Terri sat below the screen, holding the long stick puppet. She moved Little Fish, mostly from audience's left to right, as he made his escape. She slipped him behind the screen to the right, then brought him back in front on the left side, so he was always moving left to right. It kind of worked like a puppet stage when you want to show that continued motion in one direction. With her moving and me telling and clicking, the timing was a little tricky. Little Fish's movements across, behind, and back in front of the screen have to match the pace of the story, so it took some rehearsing for the two of us to time it right. The effect of the Fish in front of the screen, with the projector light hitting it, was effective, with a nice mottled look. Terri didn't move the Fish too fast, just sort of floating around. It was tempting to add a little basic PowerPoint animation, especially when the Big Fish sets out after the Fish, but we left that alone. In the book, the still images suggest just the right amount of motion, so we didn't change that. The progression of scans worked very well. 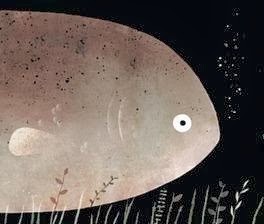 There's that great section where we see the Big Fish sleeping ("he probably won't wake up"); then awake ("he won't notice his hat is missing"); then looking up ("he won't know it was me that took his hat"), then looking forward. That's a perfect series of illustrations in the book, and they translate quite nicely to scans, where a click substitutes for the page turn. We ended it pretty much like the book pretty much. Little Fish goes behind the screen and makes a couple of confident statements from back there ("nobody will find me...") while the audience sees Big Fish approaching on the scans. Terri shook the screen a bit with the stick to show there's something going on back there. Then come the slides of the Crab watching and Big Fish floating off with hat on head. To make sure our young audience got it, we added two questions. I asked the audience: "Can you see where the hat is now?" and they did. Then it was: "What do you think happened to the Little Fish?" 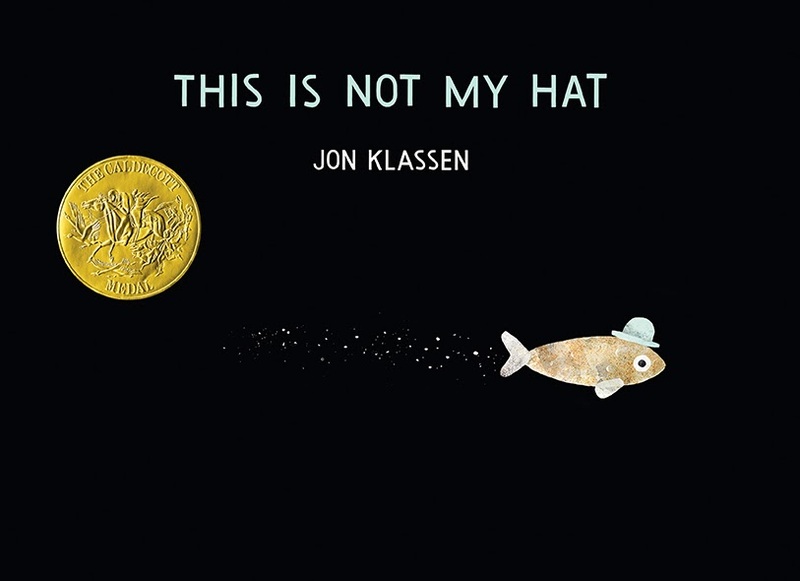 Most answers were "he got eaten," but some thought he might be back in the plants (and they're not necessarily wrong...he could be back there, unlike the definitely-eaten rabbit in Klassen's I Want My Hat Back). Terri, meanwhile, has taken Little Fish off of the stick and hidden him with tape behind the screen. So she comes up and shows us all the empty stick, inciting an extra bit of curiosity about where the puppet fish went.